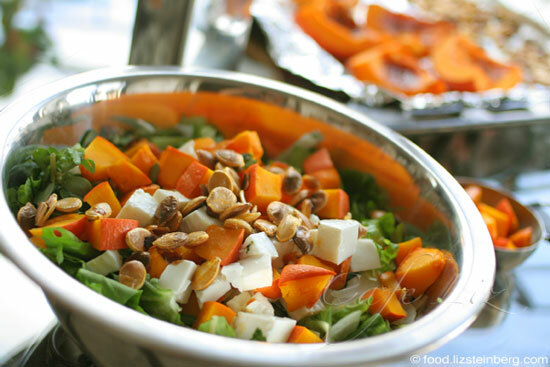 Rosewater adds a fresh, fragrant hint to this salad, and it turns out to be a lovely complement for roasted squash, too. Who would have known? The Moroccans, apparently. Chef Kamal Albaz at Al Maghreb makes a lovely salad of thin slivers of cucumber seasoned with rosewater. The menu simply lists it as “cucumber salad,” so I almost turned it down — who needs to go to a restaurant for that? Fortunately I didn’t, because it’s the best salad they serve and the flavor haunted me. I’d been planning to make my own version for a while but never got around to it, until one day I decided to toss some rosewater into a regular green, leafy salad. Potentially weird, right? But it worked — in fact, the floral fragrance complemented every ingredient. No weird clashes. 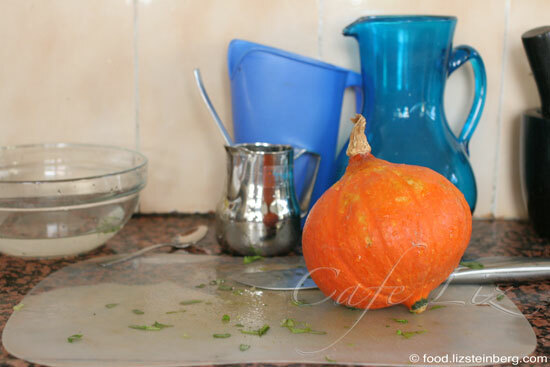 And I just happened to have this orange kuri squash sitting on the counter. That beast cost me a pretty penny — 15 shekels or so — so I wasn’t letting it go to waste. In general, you can see squash trends at the markets around here — I don’t recall seeing these summer (nee winter) squashes to this extent last year, but this year, not only is the market full of them, many of the organic CSAs are including them in their baskets, too. Most likely the work of seed suppliers. The one complication with this dressing is that rosewater can vary in strength. When using a bottle of standard industrial rosewater, I needed 3 tablespoons to get the aroma I wanted, but when I used the homemade rosewater I bought in Morocco, I needed only 1 tablespoon, and (surprise, surprise) the taste was better, too — less artificial and more reminiscent of a garden. If you’re not sure how strong your rosewater is, it’s always safest to start with less and add more, until the salad takes on a fragrant essence. Heat the oven to its highest setting — mine gets up to 290 degrees Celsius on broil. Cut the squash into manageable cubes of about 5 centimeters (2 inches) square, arrange peel-side down on a baking tray and put a small amount of brown sugar — about 1/4 teaspoon — onto each piece of squash. If the seeds look nice, you can rinse them and arrange them on the tray alongside the squash. 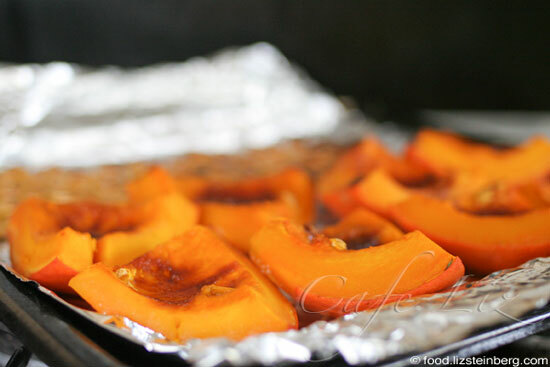 Bake for about 20 minutes, or until the squash is soft enough you’d want to eat it. The seeds may need more time to become properly crispy — as much as 30 or 40 minutes. Meanwhile, rinse all the greens. Remove tough stems and chop into bite-sized pieces. 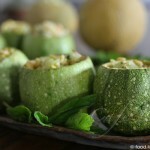 Slice the cucumber and cheese into small cubes, and slice the onion into slivers. Once the squash is baked, slice two or three pieces into little cubes, so that you have 1 1/2 cups (the peel didn’t bother me). Toss all the salad ingredients with the dressing and the olive oil. 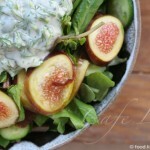 8 Responses to "Salad with roasted squash and lemon-rosewater dressing"
What a beautiful looking salad! I am just back from Finland, and so glad to have all great veggies at my disposal again,although I miss all the berries in Finland. What CSAs do you know of? That looks great. I keep Rosewater around but I never thought to use it in savory things. 1 tablespoon sounds like A LOT, though. I think the lady who sold it to me in the Pereg store told me 1 drop, like from a toothpick or dropper for 1 kilo of flour. I’m also making lavender sugar now. I’ll have to figure out what to do with it besides put it in tea. I hope it works! There are lots of CSAs. I know people who use Or-Gani and Chubeza. Both send you weekly boxes. 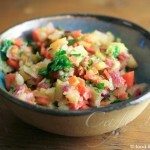 Chubeza has a great blog about seasonal produce (in Hebrew). Or-Gani’s website seems to be down, but their number is 050-4OR-GANI. Someone else I know orders through Teva Habasor, where you place a weekly order instead of getting a box of whatever the farm decides to give you. Maybe your rosewater is much stronger than mine? If I were to use one drop in a kilo of flour, you wouldn’t be able to taste it. I also have rose concentrate, which is something totally else — it comes in a little vial instead of a big bottle, and it’s much stronger. Use your lavender sugar in lemonade! Lovely, lovely – so unique. What a treasure trove of ideas… I am thrilled to have found this blog. Kudos!